Walk into any trendy Seoul coffee shop in Gangnam’s Apgujeong or Garosu-gil, and you’ll find endless tables of perfectly groomed young women in unruffled skirts and clean-cut blazers. In contrast, the neighborhood of Dongdaemun may not have an uber-classy reputation, but it lays claim to Doota, a 10-floor, 540-store shopping mall that is open from 10:30 a.m. until 5 a.m., five days out of the week. Doota’s entire B1 level, which is devoted to street fashion, boasts a modest and minimalist retail environment. Stores on this level mostly feature Korean brands ranging from girly to hipster to clean-cut. What they have in common, however, is that they dispel the dark and dreary perception of winter wear, instead favoring colors, patterns and textures. Several labels at Doota are challenging uniformity and promoting versatility in Korean street fashion. If girly is your style, the multi-label store Good & Good features a distinctive selection of winter dresses and coats from designers such as Coco Joanne. Founded in 2006, Coco Joanne targets women in their early 20’s to mid-30’s with an aesthetic that is, according to its website, “chic” and “trendy.” From alphabet prints to cool pastel green tones and deep orange hues, Coco Joanne’s long-sleeve fluted dresses brings a welcome dash of patterns and colors to winter while flattering the feminine figure and cinching the waist. While the dresses evoke an afternoon at high tea, when paired with one of the collection’s A-line coats, a chic work outfit could easily be pulled off. For those who prefer fuzzy sweaters, Pinklace has no shortage. 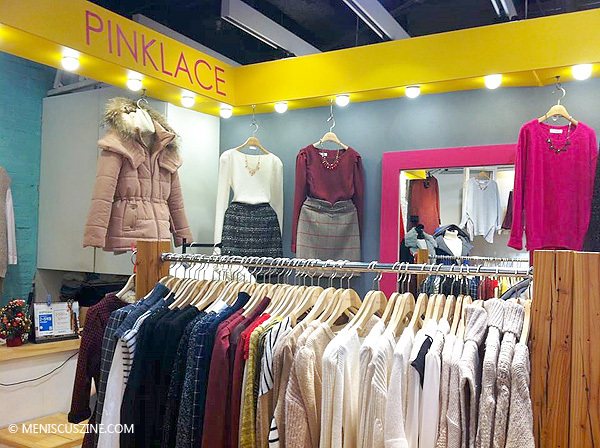 Turtleneck or V-neck, beige or hot pink, Pinklace’s versatile sweaters can be paired with a plaid skirt or dressed down with leggings. For alternatives, designers like R.Shemiste (which showed at the Mercedes-Benz Fashion Week Tokyo Spring 2014 collections) and Low Classic (a Seoul Fashion Week mainstay co-run by three female designers) suit those who crave an edgy twist. R.Shemiste’s baggy and oversize sweaters come in subdued colors of grey and navy blue in contrast to Pinklace’s warm tones. Similarly, padded foam sweaters from Low Classic tend to hide the female form, instead using the wearer as a canvas to explore three-dimensional shapes and contours.